I know Mrs.WoodyP well enough to be certain she is highly in tune with what you love. You're among friends man, and we don't care what kind of floatie you have! Pat....You Sir, are a meme GENIOUS! It actually did make me LOL X10. Bravo! LOL!!!! We all know Mrs Woody is in charge! Time for something in a Blue Chair bottle! Get the .22 Woody and go get some target practice....although my blind mother-in-law could hit that hideous monstrosity shooting over her shoulder. I hear ya'......................just when you thought you knew what the definition of GAUDY was! And now my daughter wants that. Thanks. With enough margaritas you will....oh who the heck am I kidding.....DAAAAAAAANG THAT THING IS FUGLY!!! This thread is killin me smalls!!! If I drank that much..............I'd be sacred to death of seeing double. 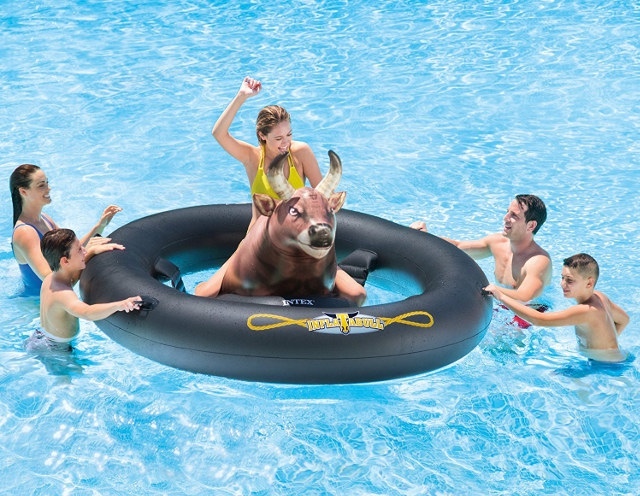 I'd take the bull over the flamingo ANY DAY!!! Woody can't ride that with his grass skirt on sorry. Margaritaville Frozen Concoction Maker, Liqour Chiller, & Drink Mixer & Party Tub----Collect 'um all!